On March 22, 2012 my grandson was born. His parents and the family had long awaited his arrival. The next day he was diagnosed with a congenital heart defect that would require open heart surgery at the age of 6 months. The date for surgery soon came and Praise the Lord all went well and Trace was quickly back at home. Each day he became stronger and ‘cuter’, of course I can say that, I’m his GaGa! Before we knew it, my son and his mother were planning his first birthday. Trace loves the Wiggles and so they decided Trace would have a wiggly birthday party! As the planning continued, my son asked if I would make his birthday cake. I soon learned that there would be not 1 but 4 birthday cakes. My son’s wife wanted to have A Wiggles sheet cake, the Big Red Car, Wags the Dog and a ‘little’ Big Red Car for Trace to be able to destroy on his own. Although I am very proud of all the cakes, Wags was ‘the one’ for me! Follow along as I tell you the story of how Wags came to be. By the age of 6 months GaGa had become familiar with all of the Wiggles characters and each day Trace and GaGa would watch a Wiggles video. Out of all the characters, I was partial to Wags as I love dogs. Now the task at hand, how do you make a Wags cake? Where or where is a picture of Wags or where or where can it be? Oh – the internet you say. 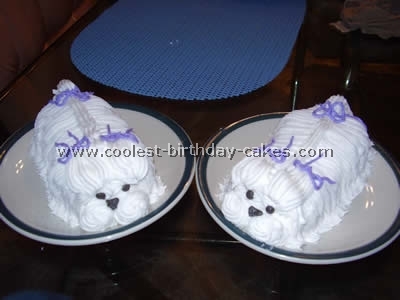 Well that’s what I did – search the internet and oh my, oh my, there were hundreds of Wags cake ideas to choose from. The picture I choose to use to make Wags for my grandson’s birthday cake is below. Oh No – Now what do I do? Clear acetate film was the answer, oh really you say. 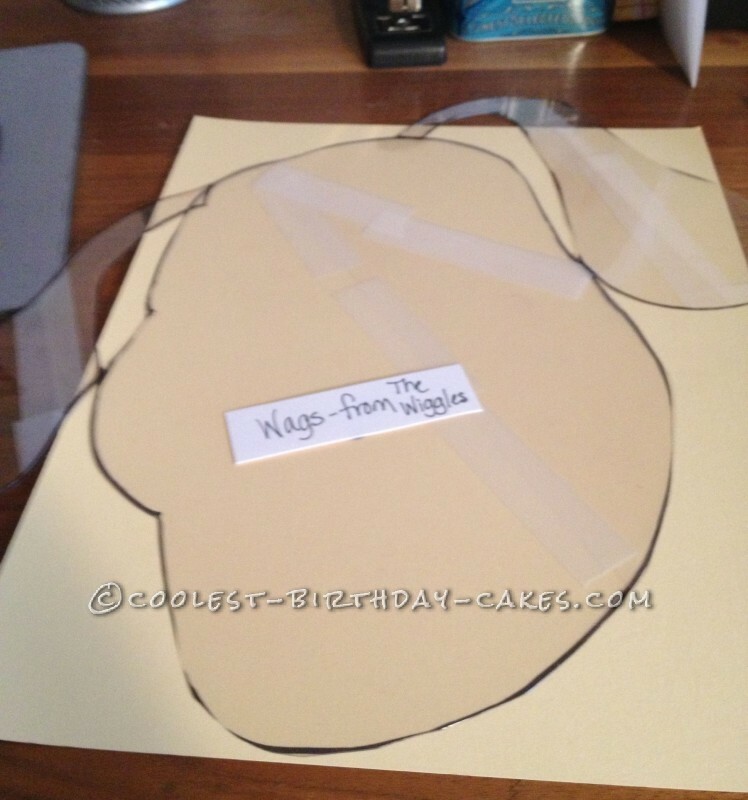 Well that’s what I did – traced Wags onto the clear acetate. Eyes, Nose and Mouth oh dear! The next step was to trace Wags’ face, etc. as you can see from the next two pictures. It’s not Shake and Bake but I can do it! Well now we are really on a roll! Ready to bake, I pulled out the sheet cake pan, the mixer, butter, eggs and the cake mixes which was super moist chocolate devil’s food – YUMMY! I sprayed the sheet cake pan with the Wilton’s Easy Release – I’ll always use that stuff from now on. Next was the job of mixing the cake mix and pouring it into the pan. Let it bake according to the directions. Dynamite! It’s done – what now? Oh yeah, gotta’ let it cool. The wheels are turning in my head – OK GaGa you’ve baked it now how are you going to make it Wags? Curious yet? Slice and Dice Wags the Dog Anyone? 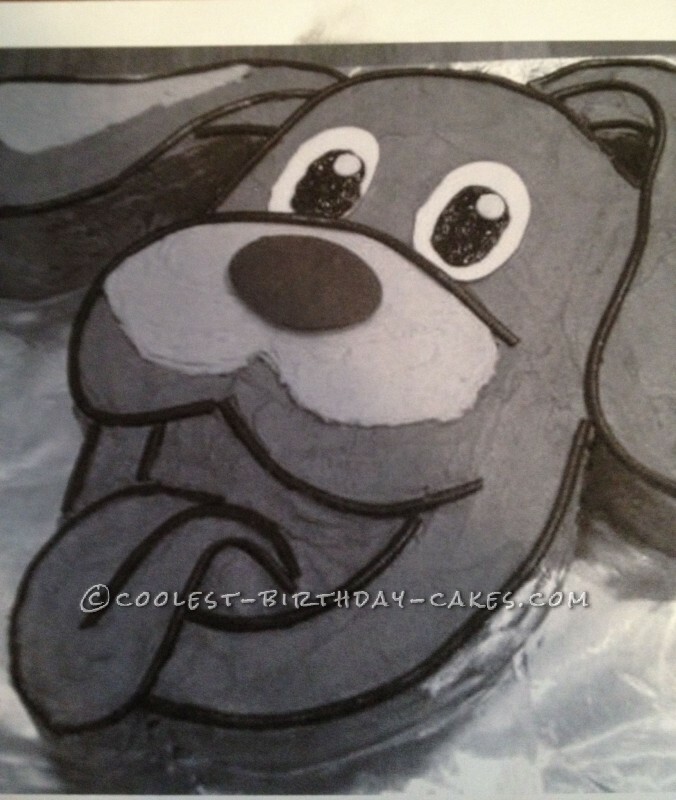 Once the cake had cooled my next step was to place the clear acetate on the cake and cut out Wags. It wasn’t as bad as I had thought – it was actually easy. I apologize that I didn’t take pictures before I began to ice the cake. I saw the contest once I had begun the process. 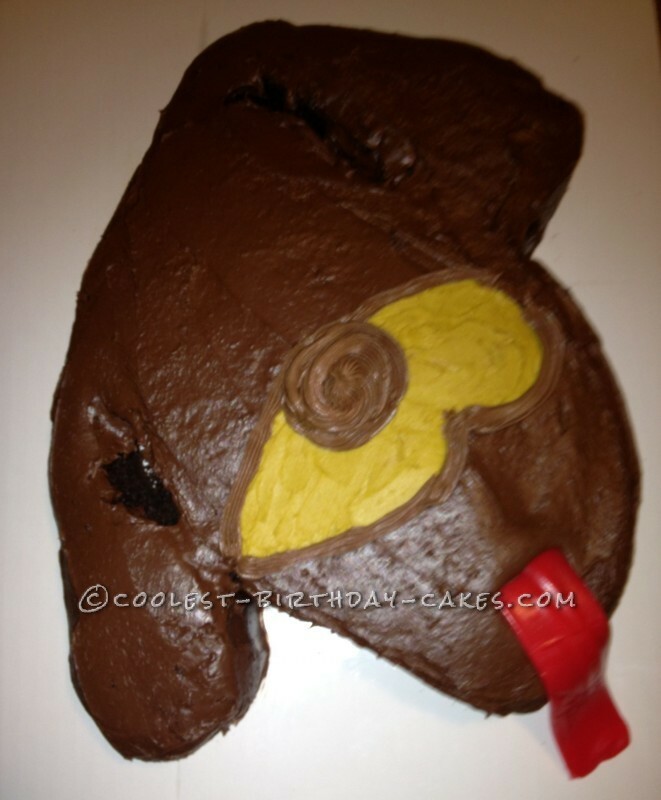 But here you can see the shape of Wags and what is devils food cake without chocolate icing. Luckily, Wags is a brown dog! Putting on the Red Tongue and It’s Done! The red tongue is made from a fruit roll-up. That was easier to do than trying to make the tongue from the cake. Perhaps I’ll give that a try the next time. Of course Wags has eyes! They were made from white icing and his pupils were made from black icing. 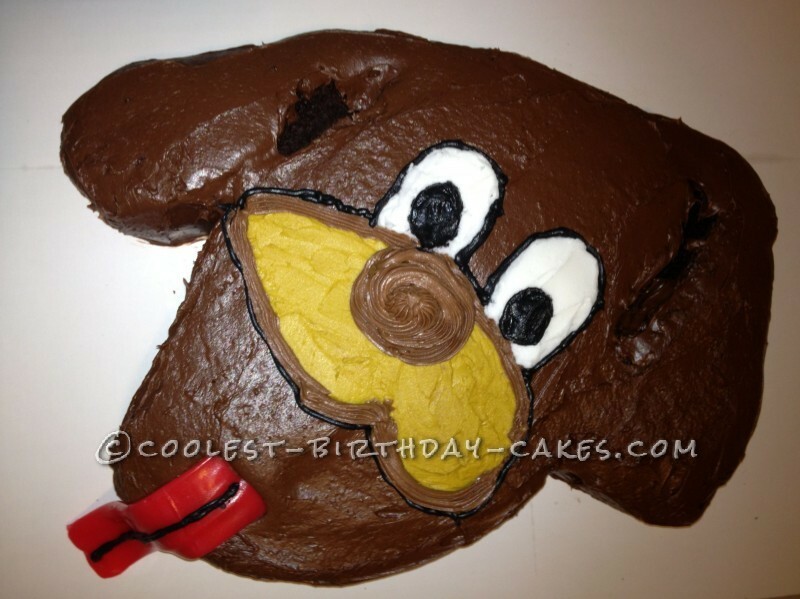 I also outline his eyes with the black icing. As you will see on the final picture, I took the black icing and made a black strip down the tongue. Are you ready? 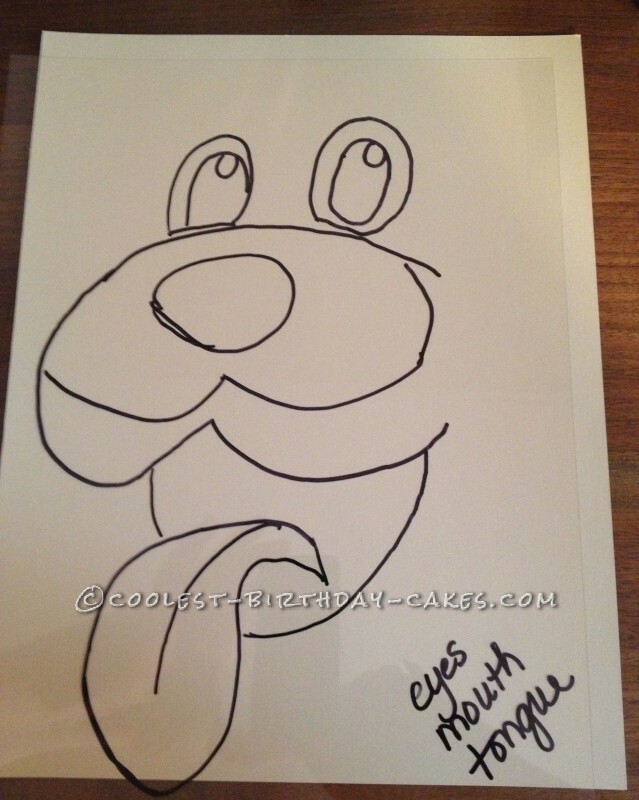 Meet Wags the Dog made especially by GaGa for her wonderful grandson Trace!